There are a number of strategies that traders use in their day trading system. Scalping - Scalping is one of the most popular strategies in which the day trader, whom is called a “Scalper”, attempts to make many profits on small price changes, literally just a few cents, and selling almost immediately after a trade becomes profitable. Many small profits can easily compound into large gains if a strict exit strategy is used to prevent large losses. Day traders who implement this strategy will place anywhere from 10 to a couple hundred trades in a single day in the belief that small moves in stock price are easier to catch than large ones. Fading - Fading is an investment strategy devoted to doing the opposite of the prevailing wisdom. In the brokerage sector, it also refers to a dealer's inability or refusal to fill an order at the prevailing bid/ask spread the dealer has published (that is, the dealer "fades" from trading). Fade day traders love to do what's out of favor, they zig when everyone else zags. They tend to buy when everyone else is selling, sell when everyone else is buying, and wait when everyone else is active. The result is that the contrarian often buys a cheap security that everyone else is calling a dog and sells a security that everyone else is clamoring to get into. Fade investors often look for stocks with low price-to-earnings ratios. When the market goes up, they sometimes prefer value stocks value stocks to growth stocks ; when the market goes down, they often favor growth stocks over value stocks. It is important to note that fade investing often works best for investors who have thoroughly analyzed the fundamentals of the companies they invest in. Daily Pivots - This day trading strategy involves profiting from a stock's daily volatility. This is done by attempting to buy at the low of the day and sell at the high of the day. The pivot point is the level at which the market direction changes for the day. Using some simple arithmetic and the previous days high, low and close, a series of points are derived. These points can be critical support and resistance levels. The pivot level, support and resistance levels calculated from that are collectively known as pivot levels. Every day the market you are following has an open, high, low and a close for the day. This information basically contains all the data you need to use pivot points. Because so many traders follow pivot points you will often find that the market reacts at these levels. This give you an opportunity to trade. Momentum Trading - This strategy usually involves trading on news releases or finding strong trending moves supported by high volume. One type of momentum trader will buy on news releases and ride a trend until it exhibits signs of reversal. The other type will fade the price surge. Momentum trading can also be known as breakout trading. Day trading is a difficult skill to master. As a result, many of those who try it fail. But the techniques described above can help you create a profitable strategy and with enough practice and consistent performance evaluation, you can greatly improve your chances of beating the odds. 1. The first Day Trading System is the Trading Pro System by stock trader Jens Cleaver. Jens Clever is a stock trading coach in New York City. He started his trading career at an early age, and has a passion for trading, but he isn’t interested in solely making his income from winning trades. He’s also interested in teaching, writing, and gaining a more comprehensive understanding of trading. This course will teach you how to trade stocks as a business, and is a full stock trading course as well as a day trading course. A total of 41 videos within the course. How to take advantage of breaking news stories that will make stock prices skyrocket or plummet. Five strategies: Five ways to get out and put money in your bank account before the stock market closes. Learn how to trade Options to enhance your Leverage and Profits. How to get your hands on the same tools and information Wall Street power brokers have used for decades. How to Day Trade Selling Short as the market goes down. He also includes Four free bonuses! This is much more then a Day Trading System course, it's a complete Stock Trading System that anyone can follow. And the really cool part is you get a 60-Day, 100% Money Back Guarantee. 2. 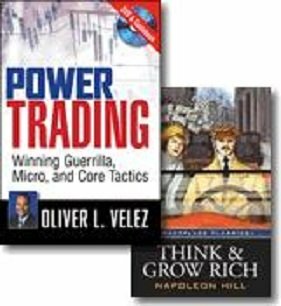 The second Day Trading System I recommend is called Power Trading by master day trader Oliver Velez. Oliver is an international best selling author, world renowned day trader, an entrepreneur. 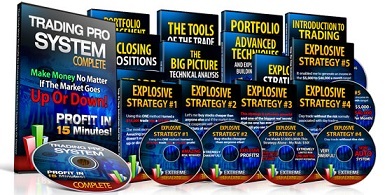 His stock trading seminars have been attended by 10's of millions of traders all over the world. Dow Jones has dubbed Oliver, “The Messiah of Day Trading” and financial programs on CNBC, Bloomberg and Fox News frequently seek out his expertise. His best selling book Tools and Tactics For The Master Day Trader is a classic in my opinion, and is a must read for you. This book will take you behind the scenes, and show you how today's top day traders arm themselves - both psychologically and intellectually - for the day-in, day-out challenges of a limitless day trading career. The book also will teach you potent trading strategies, technical skills, intuitive insights on discipline, psychology and winning methods for capturing more winning day trades for your day trading system. Micro Trading Tactics: Quick fire tactics that work in bull or bear markets and what period of the market day provides the best risk/reward—and what times to avoid. Core Trading Tactics: How to precisely time entry & exit points and how core trading differs from investing—and the tools needed to be a successful core trader. Guerrilla Trading Tactics: 13 must-know, dynamic day trading plays, some with a success rate of 80% or more; 2 key strategies: trading to build wealth vs. trading for income and special tactics for playing excess volatility. A very easy to understand presentation, and the Guerrilla Trading Tactics is worth much more then the price of the whole course itself! And as a free bonus, you get the classic Think and Grow Rich by Napoleon Hill. This book is timeless and will teach you the secrets and mindsets of succesfull wealthy men. It will show you not only WHAT TO DO but HOW TO DO IT. If you learn and apply the simple basic techniques revealed here, you will have mastered the secret of true and lasting success. Click Here to Research Power Trading. 3. 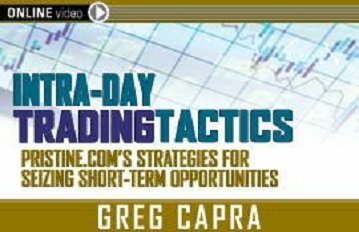 The third Day Trading System Strategy is Intra-Day Trading Tactics by Greg Capra. Greg Capra is the President and CEO of Pristine Trading for over 21-years and is known as pioneer in the online trading and investing industry. 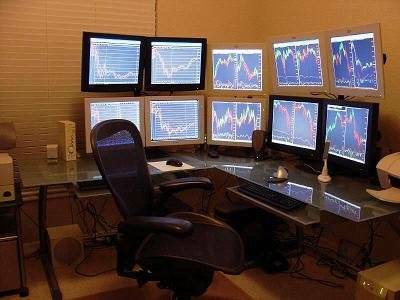 Thousands have been educated to become self-directed traders and investors through his in-depth seminars on foundational technical concepts that Mr. Capra started and still uses to this day, to advanced technical strategies and analysis of price action that he later developed, to market internals, position management and money management. Mr. Capra has won numerous real-money, real-time trading challenges. McGraw Hill Publishing and Wiley Publishing each commissioned Greg to author several books and DVDs on the subject of technical trading and investing. These are but a few of the points that Capra outlines in this comprehensive day trading learning set. Use the book and online video to develop a working, hands-on knowledge of moving averages, risk limits through relative strength analysis, and targets that will position you for huge gains with minimum financial risk. This course will give you everything you need to achieve intra-day trading mastery for your day trading system. Recommended Day Trading Tools and Resources. Learn To Eliminate Risk in Day Trading! Learn Everything You Need To Achieve Day Trading Mastery! Have you used any of our recommended Day Trading Systems? Did you experience a positive impact from it? Share your personal experience and write your review including how it helped you the most for Day Trading Stocks in the stock market. Return From "Day Trading System" to the Home Page "Stock Market For Beginners"